I have to admit that I have this problem with buying whole chickens when they are on sale. I just can’t resist when the price is super low because it’s such a good value. I store them in my “freezer pantry” and make recipes like this one. So now you know about the whole-chicken “collection” that I have in my freezer. 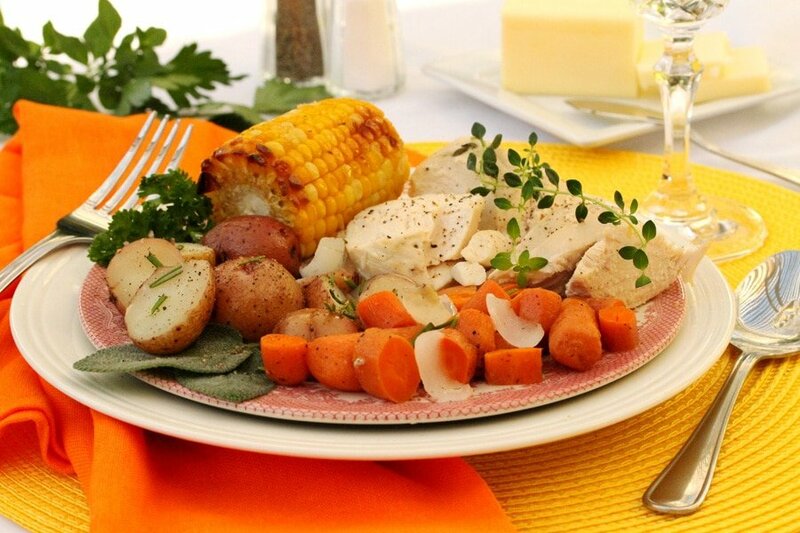 This chicken recipe is made in my fave oval roaster that’s big enough for potatoes, carrots, onions, and corn on the cob. So, I throw them all into the pot and roast everything together with some delicious herbs, olive oil, white wine, salt and pepper. I love using fresh herbs when cooking but can’t get past how much they cost when buying them in the grocery store. So that I don’t drive myself crazy by doing a cost-benefit analysis every time I want herbs for a recipe, I started growing my own. This works out so great because I just snip off as many herbs as I need at a time, and they are fairly easy to grow. I grow them in pots outside in a patio area so they get just enough sun. 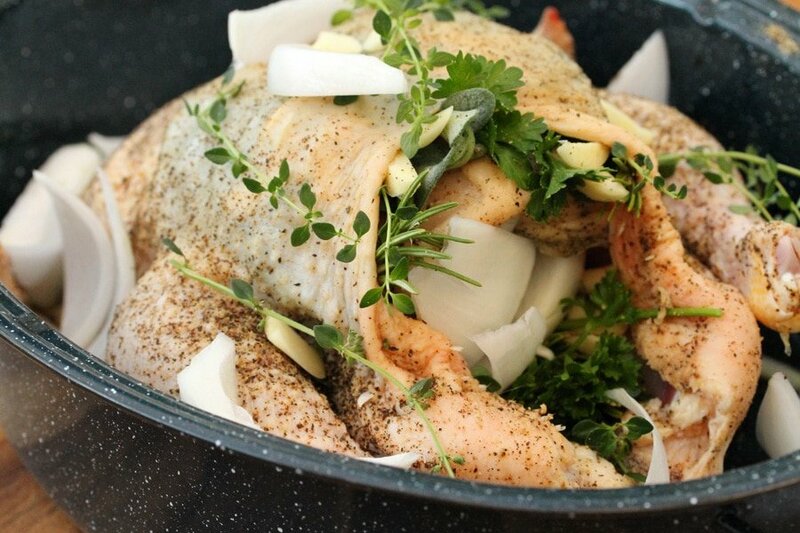 This recipe is so delicious and smells really good in the house when it’s cooking! 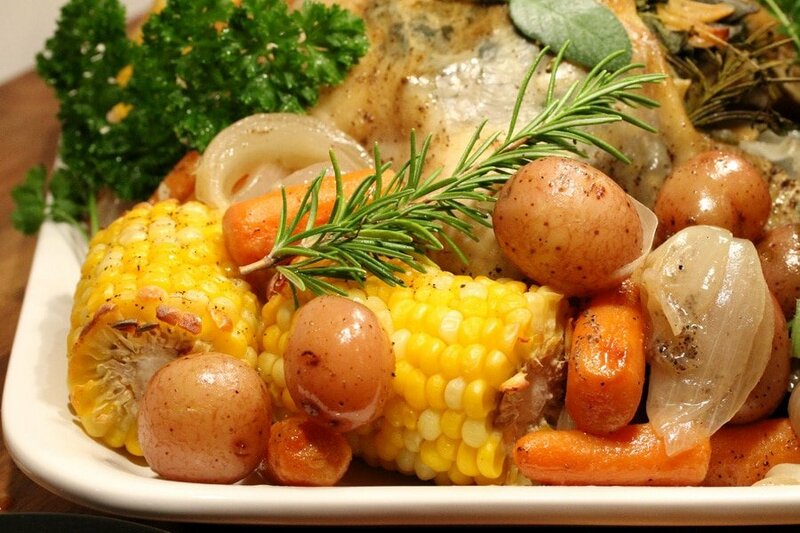 Discard the loose organ meat from the cavity of the chicken unless you like to cook with it. Rinse the chicken with water (inside the cavity and the outside of the chicken). Then put it in a roaster pan. Sprinkle the pepper around the entire chicken and inside the cavity. 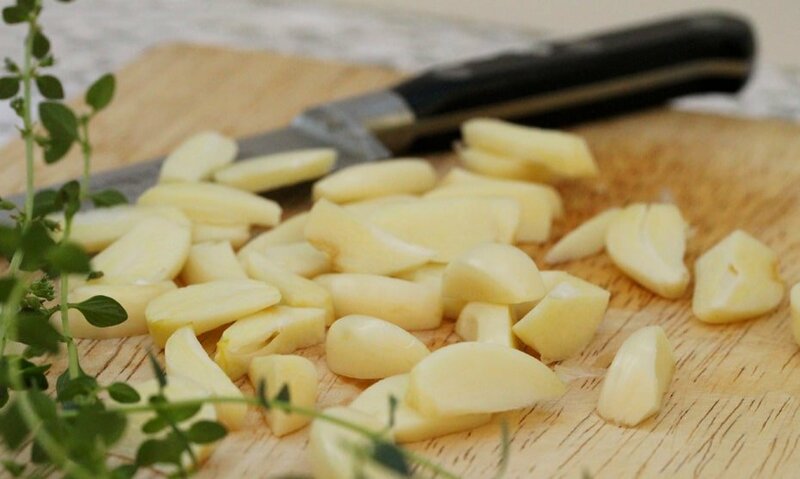 Cut the garlic cloves in half, or in thirds if it’s a large clove, and set aside. On the top part of the chicken just above the cavity, separate the skin just a bit from the breast meat. 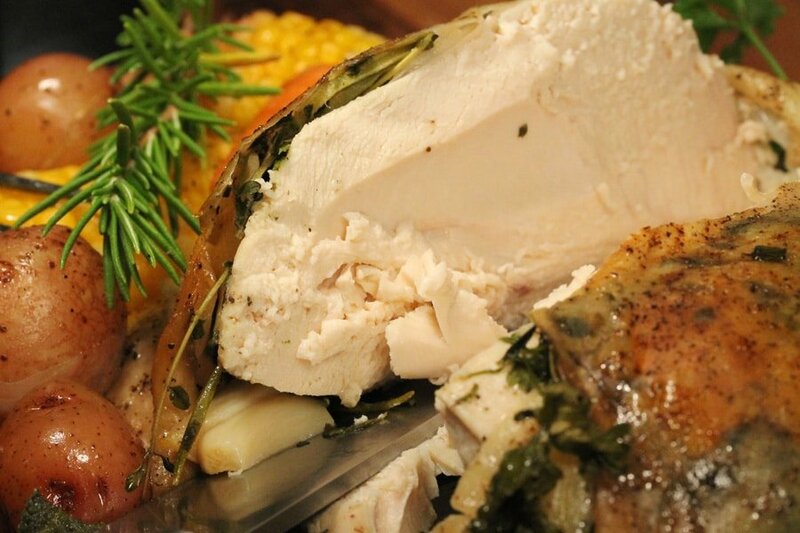 Take half of the quantity of parsley, sage, rosemary and thyme and gently push it in between the skin that is separated from the breast meat (no need to chop the herbs, it works fine using the entire sprigs). Reserve the remaining half of the herbs. Take about a third of the quantity of garlic, and also gently push it into the skin that is separated from the breast meat along with the herbs that are already there. 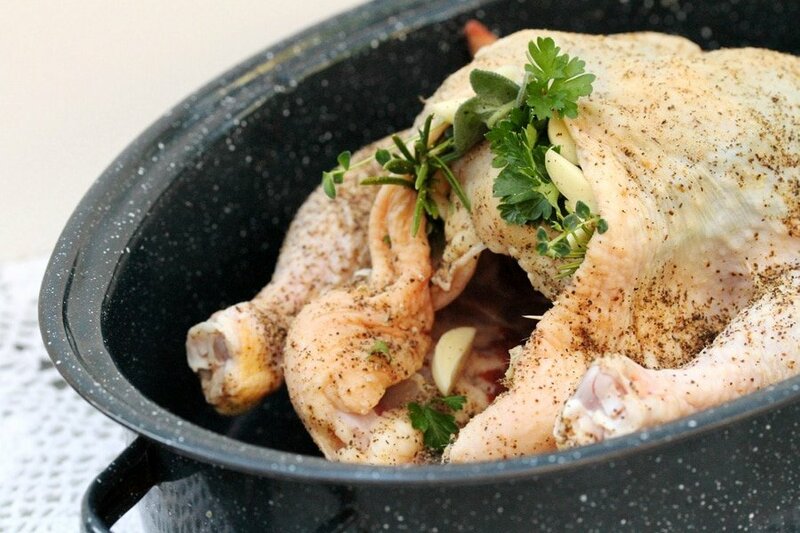 Then take the remaining half of the herbs and put them into the cavity of the chicken; also add about 1/2 of the remaining cut garlic into the cavity of the chicken. 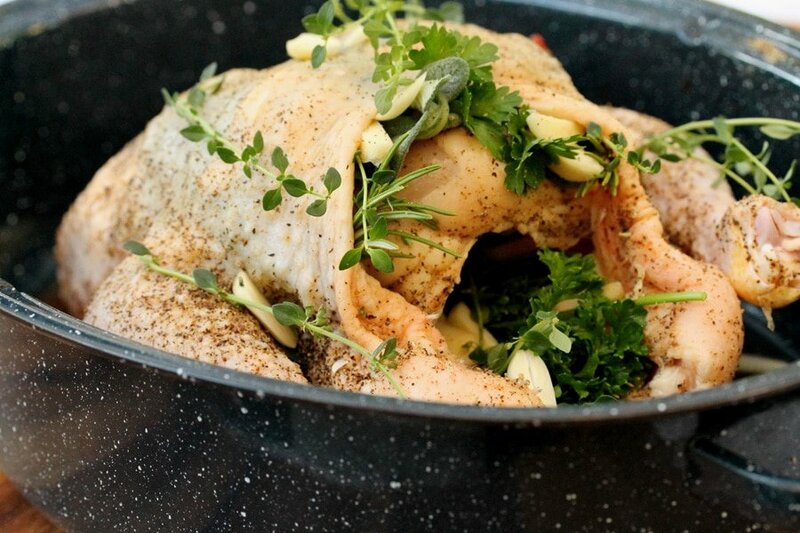 Sprinkle the remaining cut garlic around the outside of the chicken in the roaster pan. 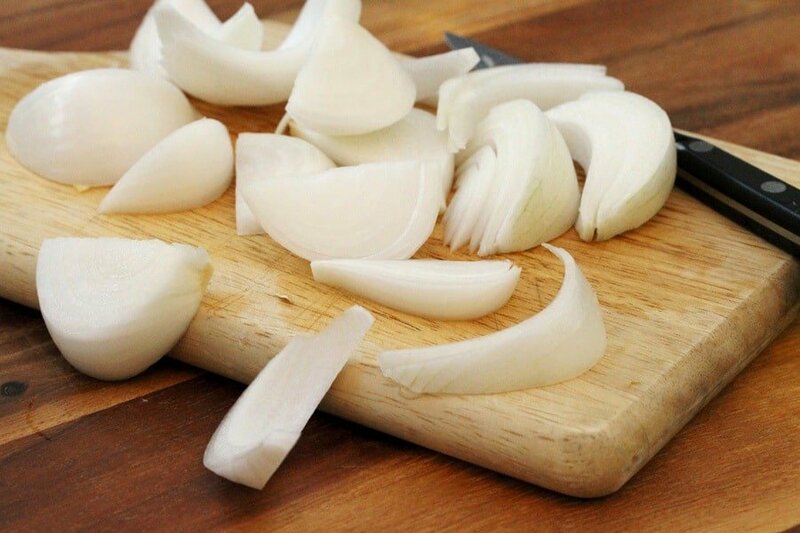 Cut the onion into fairly large pieces. Add the onions to the roaster pan and also put some into the cavity of the chicken. Add the mini red potatoes to the roaster pan. If you’re using small red potatoes cut them in half. Then add the carrots to the roaster pan. Then sprinkle the salt over the chicken and vegetables in the roaster pan. Also, sprinkle a bit of additional pepper if you like. Clean the corn and cut the ears into three sections. Add to the roaster pan and sprinkle with a bit of pepper. 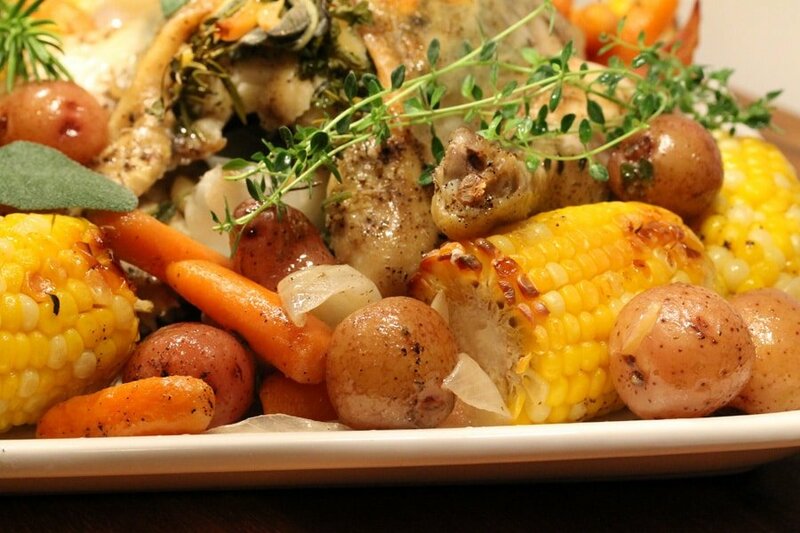 Drizzle the olive oil over the chicken and all of the vegetables. 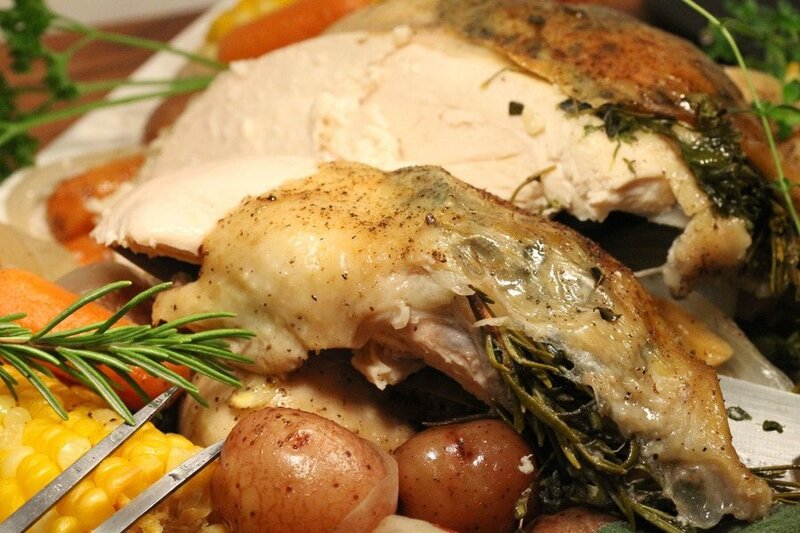 Add the wine so that when you pour it, some will go into the cavity of the chicken. Cover the roaster pan with a lid (or foil if you don’t have a lid). Bake in a preheated oven for about 1 hour and 20 minutes. The chicken I used in this recipe weighted about 4.80 pounds and I removed it from the oven after about 1 hour and 20 minutes. 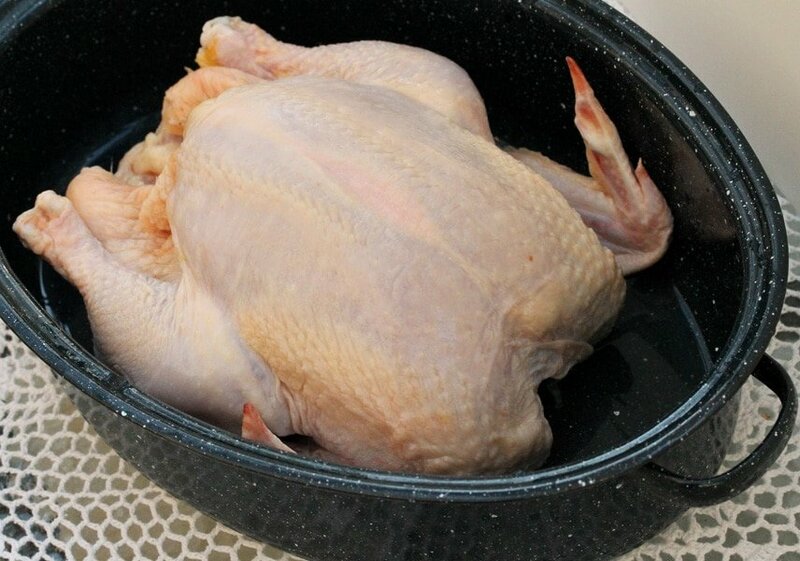 When you remove the chicken from the oven, keep the lid on and let it rest for about 15 minutes before cutting it. 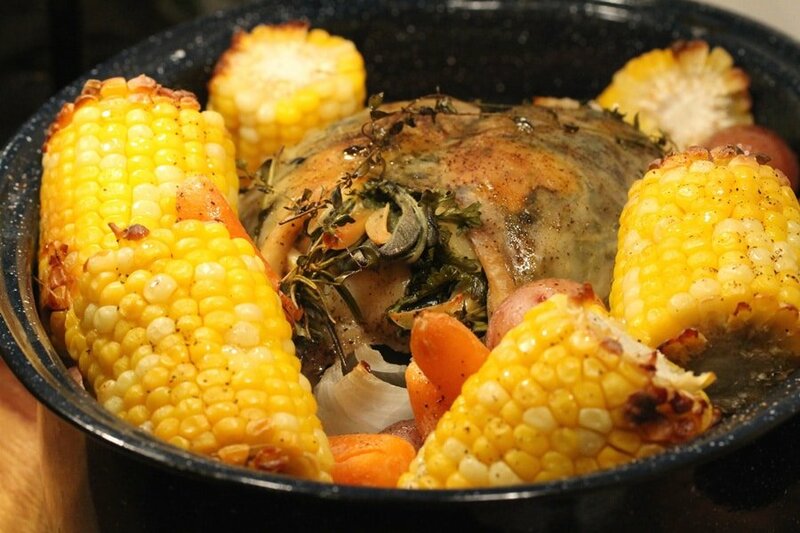 Here is a picture of the chicken and vegetables after they rested with the lid on. Serve on a platter or in plates with individual servings. After letting it rest, the chicken should be nice and juicy when you cut into it. 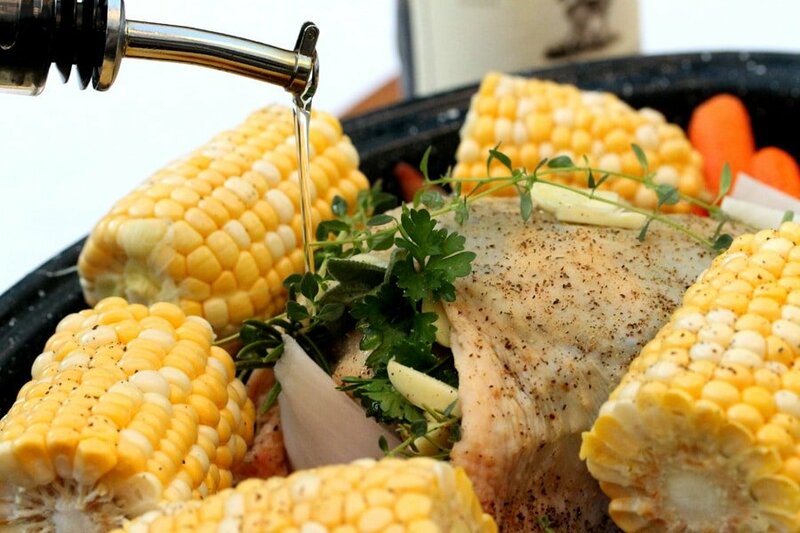 For each serving, ladle some of the liquid left in the roaster pan over the chicken and the vegetables. You may need to salt to taste. A delicious comfort food one-pot meal. 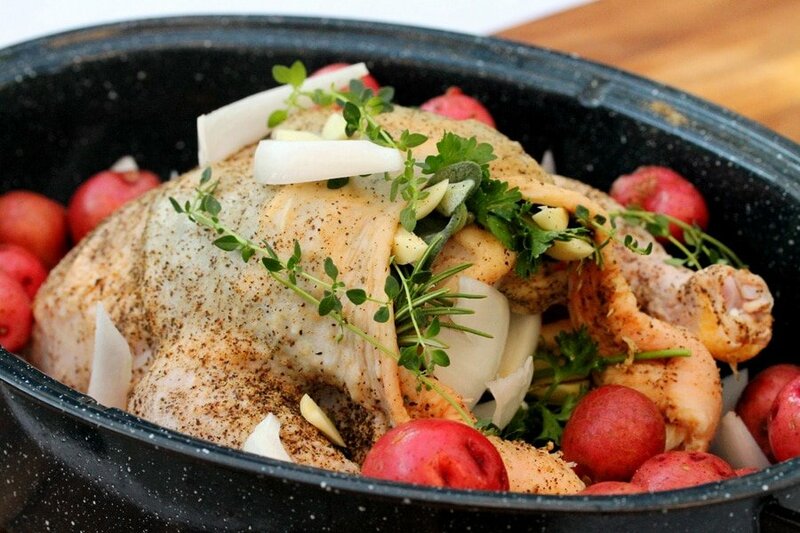 For the Whole Chicken - Remove and discard the loose organ meat from the cavity of the chicken. To the roaster pan, add the chicken flat-side down (breast side up). 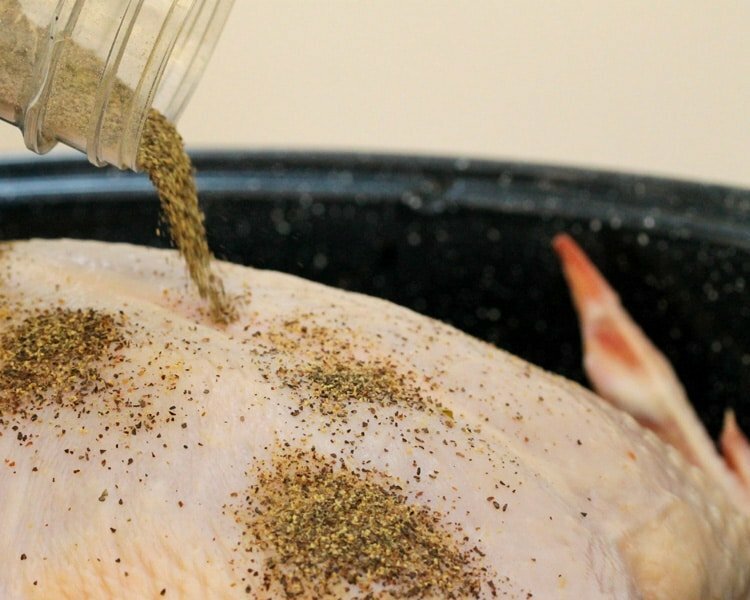 Sprinkle pepper around the entire chicken and inside the cavity. For the Herbs and Garlic - On the top part of the chicken just above the cavity, separate the skin just a bit from the breast meat. 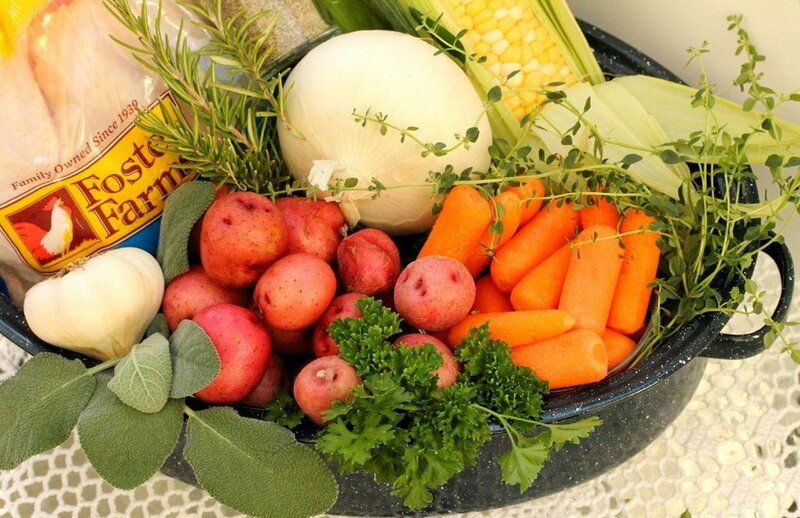 For the Onion, Potatoes and Carrots - To the pan, add the onions and also put some into the cavity of the chicken. Add the mini red potatoes to the roaster pan. 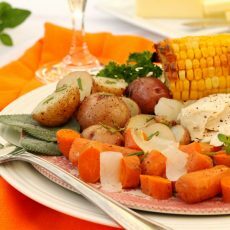 If using small red potatoes instead of the mini ones, cut the small size potatoes in half. To the roaster pan, add the carrots. For the Corn on the Cob - To the roaster pan, place the corn wherever there is room and sprinkle them with a bit of pepper. 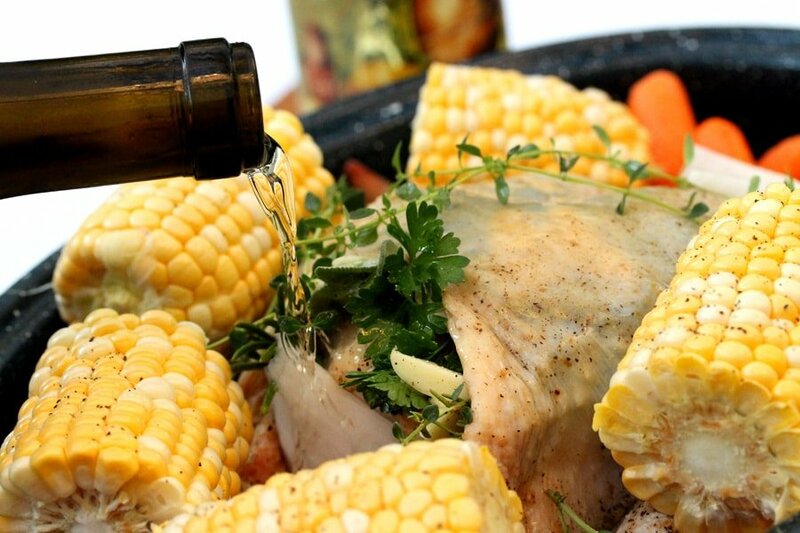 For the Olive Oil and Wine - Drizzle olive oil over the chicken and all of the vegetables. To the pan, add the wine so that when it's poured in, some will go into the cavity of the chicken. 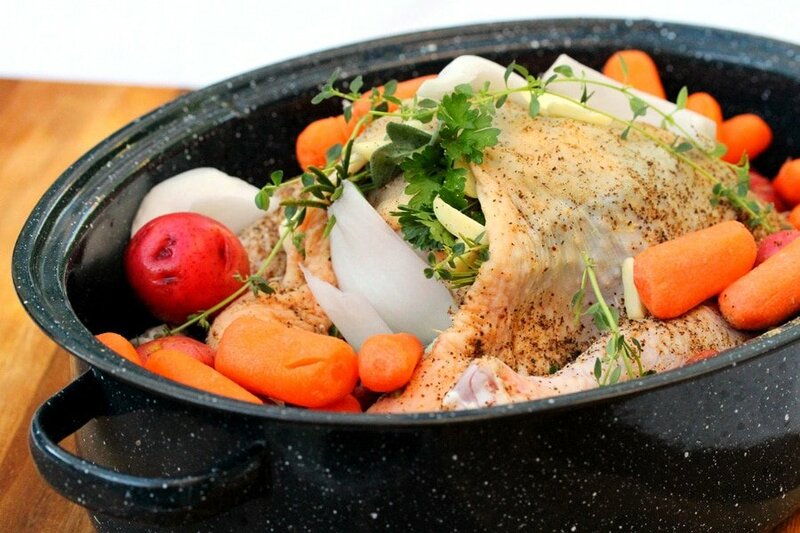 For Roasting - Cover the roaster pan with a lid and bake in a preheated oven until the chicken is completely cooked and tender (about 1-1/2 hours). Cooking time may vary depending on the size of the chicken; in this recipe the chicken is about 5 pounds. 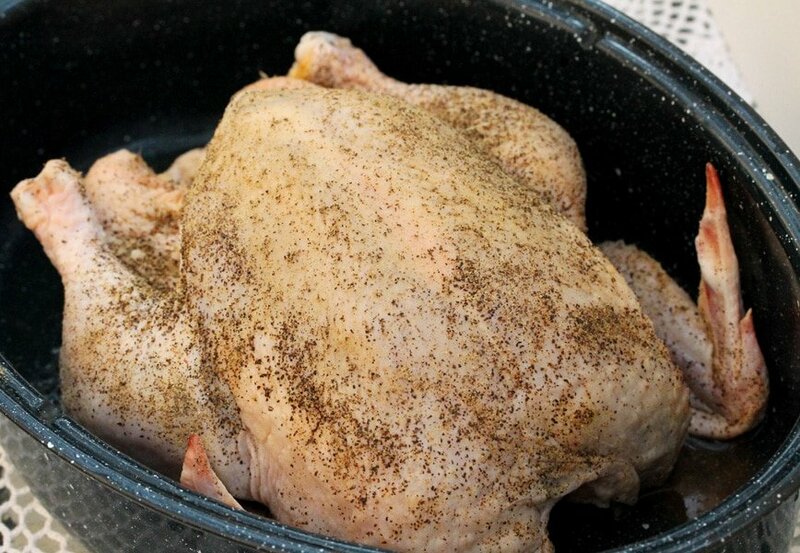 When removing the chicken from the oven, keep the lid on and let it rest for about 15 minutes before cutting it. After letting it rest, the chicken should be nice and juicy when its cut into. 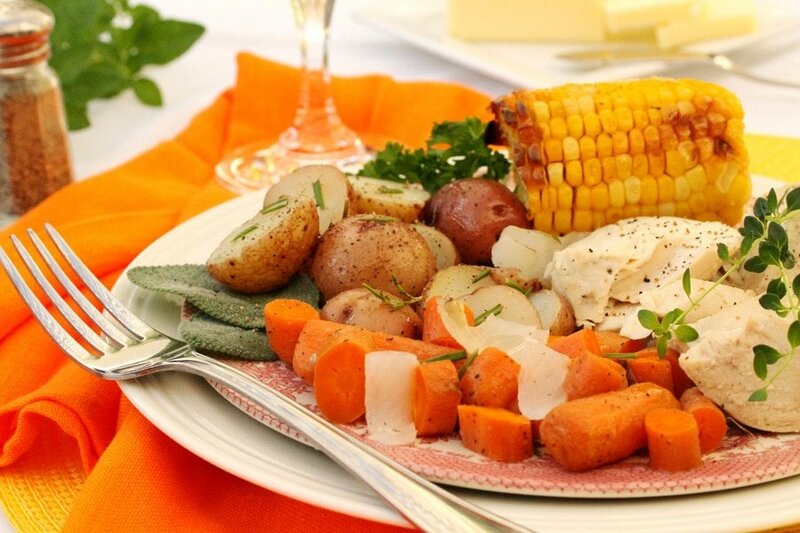 Serve while warm on a platter or in plates with individual servings. 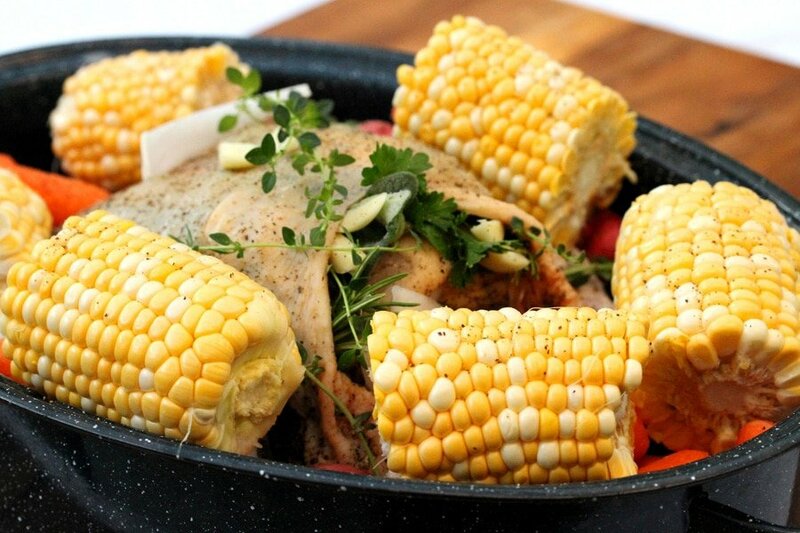 For each serving, ladle some of the liquid left in the roaster pan over the chicken and the vegetables. Do a taste and add more salt as needed. I have to stop reading your recipes now….My stomach is growling!! LOL! Thank goodness calories are not wireless! Oh my yumminess!! That’s delicious! Oh, and beautiful photos!